If ecological restoration is your vocation, think: location, location, location. 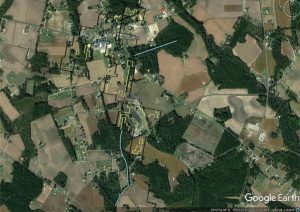 Researchers identified 650 sites in North Carolina that could feasibly be prioritized for restoration. For one community in the southeastern part of the state, candidate ecological restoration areas are outlined in black. Impaired streams are shown in blue, and potentially restorable wetland areas are shown in yellow. Image courtesy of Ecological Restoration. The practice of assisting in the recovery of a degraded or damaged ecosystem, ecological restoration on a targeted site is a piece of a larger puzzle. “Many scientists and managers recognize the importance of the surrounding landscape because this context often determines the success of restoration activities. However, the prioritization of restoration sites based on this context isn’t yet a common practice,” says Kurt Riitters, a research ecologist with the U.S. Forest Service Eastern Forest Environmental Threat Assessment Center. A new database could change that, following a study led by U.S. Environmental Protection Agency (EPA) Senior Research Biologist James Wickham. Natural resource managers facing limited funds and time can use the database to plan their efforts in order to maximize benefits to society and the environment. A paper published in Ecological Restoration describes the development of the database and its application to real-world planning at the state level. 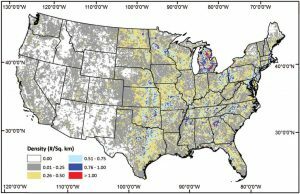 Research partners, including Riitters, ran U.S. land cover data through software that recognizes and categorizes spatial patterns. These patterns are closely tied to ecological processes such as the flow of water and nutrients, habitat and wildlife movement, and disturbance responses. The researchers were looking for relatively small sites with patterns indicating a potential need for revegetation that were also close to other sites with existing natural vegetation. They identified more than 1.1 million candidates, most highly concentrated in the East and the Great Plains. To help restoration ecologists narrow their focus within this set of candidates, the researchers added information about site characteristics for each candidate in the database. They included the candidate’s area, connection to surrounding sites, roads, streams, soils, and land cover—17 attributes in all—that provide important landscape context. A map shows the density of candidate ecological restoration candidate sites by watershed. Most are in the East and the Great Plains. Image courtesy of Ecological Restoration. Researchers demonstrated how the database could be used in North Carolina, which has an existing planning database of forest lands suitable for restoration and conservation. They combined the candidate database containing 33,000 North Carolina sites with the state’s planning database. When they filtered for sites already deemed high priority by state officials, as well as candidate sites conducive to wetland restoration and those with impaired streams, they zeroed in on 650 sites that could be feasibly prioritized for restoration. “We demonstrated an application of the database that addresses three inter-related goals: water quality, wetland restoration, and reforestation,” says Riitters. “The focus on impaired waters [already mandated for restoration by the U.S. Clean Water Act] and the state’s highest priority forest restoration areas has the potential to attract investment from multiple stakeholders.” That’s good news for North Carolina and other states facing critical—and often expensive—restoration projects. The database of ecological restoration candidates will be available online through the U.S. Environmental Protection Agency’s (EPA) EnviroAtlas website. Additional research partners include Peter Vogt (European Commission Joint Research Centre), Jen Costanza (North Carolina State University), and Anne Neale (EPA).